Celebrating 260 years, Cox & Kings Ltd., has yet again emerged as Asia's Leading Luxury Tour Operator, India's Leading Tour Operator and India's Leading Travel Agency at the World Travel Awards, globally known to be the ultimate hallmark of excellence. 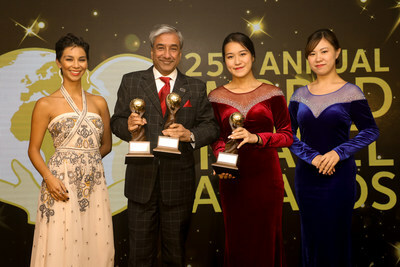 The gala awards ceremony was held at InterContinental Grand Stanford Hong Kong and attended by the luminaries of the travel industry from across the world. Peter Kerkar, Group CEO, Cox & Kings, stated, "It is a proud moment for all of us here as these awards have been voted by peers in the industry. We owe our success to the staff who have crafted wonderful journeys for our customers and help us reach many a milestone." Cox & Kings has been a consistent winner at the World Travel Awards since years. The title of Asia's Leading Luxury Tour Operator was bagged for the 4th consecutive time this year. It won India's Leading Tour Operator for the 5th time and India's Leading Travel Agency for the 6th consecutive time. World Travel Awards (WTA) was established to seek out and reward the very best travel organisations in the world - those brands pushing the boundaries of excellence and implementing ground-breaking ideas. It has been acclaimed as the Oscars of the Travel Industry. Each World Travel Awards Gala Ceremony offers unrivalled networking opportunities to members of the travel and tourism industry.